Cuba Ventures Corp (TSXV: CUV) has seen an excellent two weeks of trading activity. Long stuck under the $0.10 mark, it has finally emerged from this price range and continued upward. 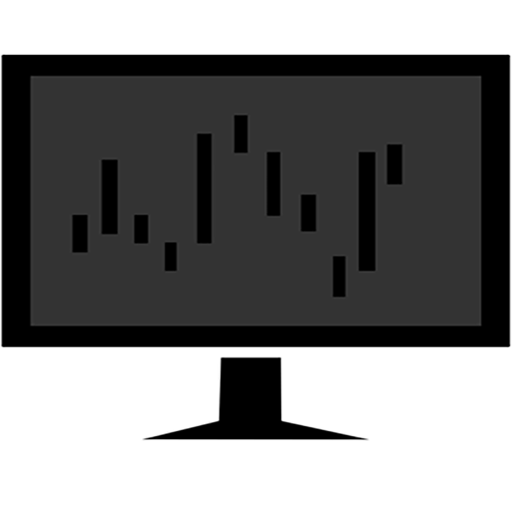 On December 8 alone, it managed to close 20% up versus the previous day at $0.265, after making an all time high at $0.375. For long term investors, this is like a dream come true. Largely, this movement is the result of a recent definitive agreement inked for the acquisition of a blockchain tech company. The purchase of this company largely plays in to the current focus of the company however, unlike many recent blockchain related acquisitions in the market. Even still, this crypto currency is destined to fail. 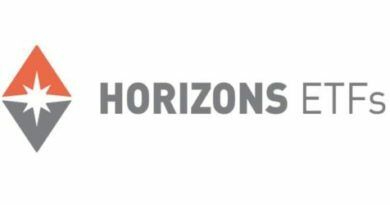 Here’s why, through the lens of a full analysis on Cuba Ventures Corp.
Cuba Ventures Corp began to take on its current form on July 8, 2015, when it announced that it had signed a definititive agreement. This agreement was to acquire 20% of Travelucion S.l., a Spain-based travel company that was focused on the market of Cuba. In addition to the travel related assets, it had a total of 432 websites related to that of Cuban tourism, culture, and life which on a yearly basis had over 30 million pageviews. Under the terms of the agreement, 20% of Travelucion would be acquired by Cuba Ventures. The total price paid would be 4,000,000 shares, in addition to $100,000 in cash. Additionally, the company was left with an option to purchase the remaining 80% of Travelucion within the next eight months. This definitive agreement closed on October 20, 2015, with the completion of the initial purchase. On February 1st, 2016, the company issued notice to Travelucion that it intended to purchase the remaing 80% of the company. This final transaction was completed on March 18. On November 9, 2017, Cuba Ventures announced its entrance into the blockchain sector. To do so, it had signed a memorandum of understanding with Vesilen Investments to co-develop a blockchain. This blockchain would be used to create Revolupay, a phone app used for the remittance sector of the Cuban economy, which would be based on a new crypto coin called CCU Coin. The concept behind this new coin is a way of streamlining current currencies in the Caribbean. The coin would be used through the Revolupay mobile application, and allow business and individuals to be less reliant on fiat cash as a form of currency. The price would be pegged to several international currencies to enable stability for investors and international users of the system. This phone app would then be used for all transactions completed on the island in theory, with Cuba Ventures generating cash through a fee structure outlined by the company. This process would begin with Cuba Ventures implementing the currency on its 432 websites, where it would immediately accept payment in the form of CCU Coin. This MOU was converted into a definitive agreement on November 24, 2017. Cuba Ventures disclosure related to Vesilen Investments. It is not clear what role these individuals possess in Vesilen Investments. Irregardless, this raises a few alarm bells with the companies definitive agreement that it signed with Vesilan. At the very least, who is really benefiting from this deal, and is there actually a knowledge transfer occurring? Currently, Cuba Ventures has two main lines of business. This consists of its Travelucion and related travel assets, as well as the proposed Revolupay assets that it is in the process of acquiring. Lets take a closer look at those to see where this company generates its income. Currently, Travelucion is Cuba Ventures’ only source of revenue. This subsidiary of the company currently possesses 432 websites focused entirely on Cuba. These include travel agencies, culture related websites, hospitality related bookings, and more. The company boasts over 35 million page views per year, as indicated within their latest investor presentation. It also goes on to claim that it is the most comprehensive Cuban resource on the internet based on its viewership. Primarily, the revenues related to these websites comes from three revenue streams based on our analysis. The first, is through the resale of travel bookings to international visitors. Being one of the few approved agents for U.S. sourced travellers, this country alone accounts for approximately 33% of its web traffic, and approximately 10% of the revenue. The second source, would be that of affiliate programs. This is largely in relation to its hospitality focused websites, where it serves as an affiliate for certain operations that can be conducted at local hospitals, such as beauty-related surgeries. Finally, the third is through ad revenue generated through its Google Adsense ad placements on it’s websites. An example of this can be seen below. 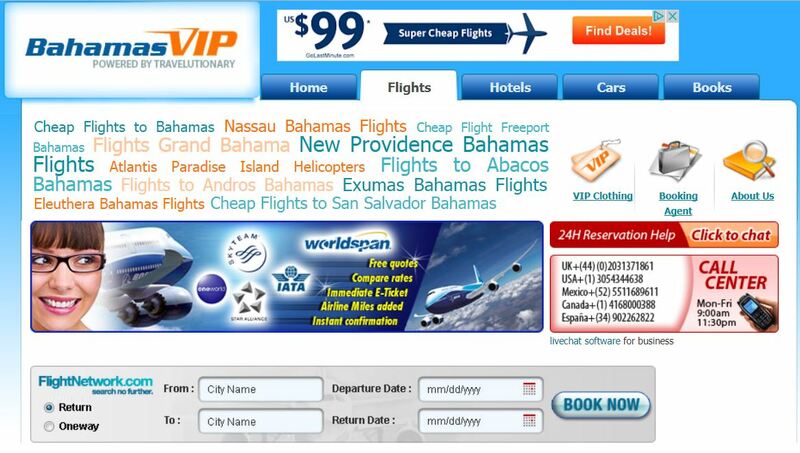 A screenshot of the Cuba Ventures owned website Bahamas VIP. Note the Google Adsense ad at the top right. However, there is something to be said for quality over quantity. The majority of the websites owned by Cuba Ventures appear to be stuck in mid 2007, when the internet was stuck on flashy banners and tag clouds. Personally, I would not be comfortable giving a website such as what is displayed above my credit card information. Thus, the company needs to ramp up its current efforts related to website makeovers. There’s also something to consider for the website stats. At 432 websites and 35 million views, that equates to roughly 6,500 views per website per month. When established on a per site basis, they aren’t overly spectacular figures. Based on the average low conversion rates seen by the majority of websites, there’s a reason the company has small revenues. Cuba Ventures would be much better off consolidating several of its websites, rather than having several hundred for the same purpose. Revolupay is essentially Cuba Ventures’ plan for ultimate success in the Cuban economy. Rather than focus on international travelers, Revolupay is focused on the nation as a whole. This is through a mobile application that will be used to transfer CCU Coin. The objective is for CCU to become the dominant currency in the Cuban marketplace, used for everything from mom and pop shop transactions, to large remittances between two organizations. Ultimately, the company plans to expand it across all of the Caribbean, replacing the use of eleven separate currencies in the region. This digital currency, like any, is based on blockchain technology. This enables transaction to be secure and occur quickly. The intention is that it will provide an alternative to the cash economy the country is currently stuck in. With the majority of retailers unable to accept credit or debit cards Revolupay will in theory be able to flourish in the country, by providing a means of payment that doesn’t require users to carry cash. Cuba Ventures anticipated revenues from Revolupay. Snippet from November investor presentation. The implementation of Revolupay and CCU Coin will begin with Cuba Ventures current list of 432 websites. Upon completion of the mobile app, CCU Coin will be made available to pay for services on these websites. This will enable international travelers to have access to the coin, and to use it for payments. From here, it is anticipated that it will be pushed out to retailers on the island nation, so that it can be used as a form of cash-free payment. In turn, these small businesses will then either deposit it in to their bank, or use it to make purchases themselves. It is intended that all major banks on the island will be able to accept the coin as a form of currency. However, this is a heavily flawed concept. We’ll tell you why in a moment. In terms of revenue, Cuba Ventures is doing a decent job of bringing in business. In the first full year of operations with its new asset, the company posted revenues of $2.5 million. For its first year, that’s not a bad figure. Net profit was also excellent, at slightly over $800,000. This equates to a gross profit margin of 32%. Unfortunately, the company was hammered by its operation expenses. Cuba Ventures’ revenues for the previous fiscal year. Most notable of these expenses, is that of consulting fees. These fees equate to approximately 20% of total revenues earned, which is exceedingly high. The other significant item, amortization, is related to the purchase of Travelucion in the previous fiscal year. 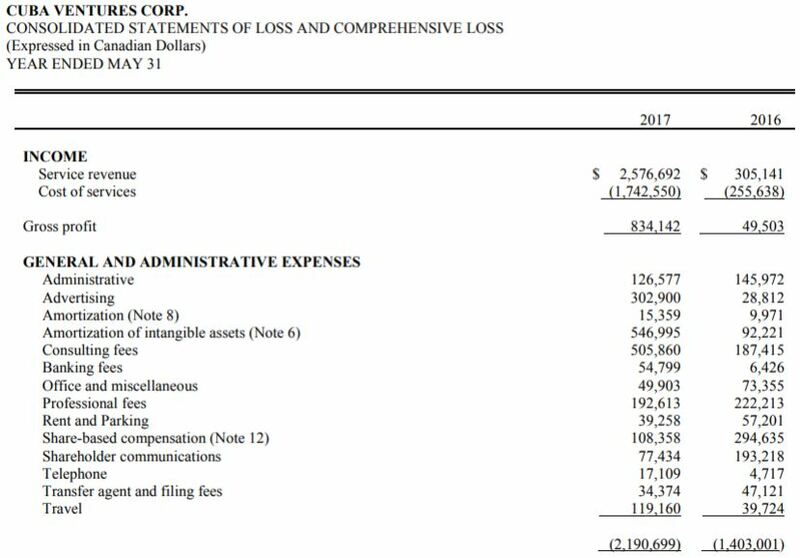 Overall, the company posted general expenses of $2.2 million, almost the equivalent of total revenues during the period. Clearly, this is not a sustainable practice and costs need to be cut. When we went to compare the most recent financial periods however, there were some major discrepancies. Below, is a snippet from the MD&A published September 28, 2017, in relation to the quarterly financial statements. Simply, the figures listed in this table do not match what was posted on a quarterly basis and thus raises concerns. Snippet from Cuba Ventures Sept 28, 2017 MD&A document related to annual financials for fiscal year 2017. Based on this table, it appears that the quarterly financials are quite steady, with little rise or fall aside from the second quarter earnings. Consistency is an excellent thing. However, lets take a look at what these quarterly interim financials actually stated for revenues. Cuba Ventures quarterly revenue for Q1 2017 as per interim financials filed October 31, 2016. Cuba Ventures quarterly revenue for Q2 2017 as per interim financials filed January 31, 2017. Cuba Ventures quarterly revenue for Q3 2017 as per interim financials filed April 28, 2017. Based on the interim financials provided throughout the 2017 fiscal year, this would infer that Cuba Ventures actually posted a loss of revenues in the fourth quarter of 2017. This is based on the nine month total revenue for 2017 being listed as $2,718,636. Meanwhile, as per the annual statement issued September 28, 2017, the revenues for the year totaled $2,576,692. This requires that $141,944 in gross revenues were lost during the fourth quarter of 2017. Yet, total gross profit on these revenues somehow managed to increase from $576,970 to that of $834,142 as of the year end. Simply, these figures do not add up. The current share structure of Cuba Ventures Corp is severely limiting the future potential for the company over the next few years. It has repeatedly released warrants and options at levels below $0.10, thus creating downward pressure on the equity as the price begins to climb. The only saving grace, is the current outstanding share count. As per the news release issued December 8, 2017, this figure is 85,393,036. Cuba Ventures’ share structure as of December 9, 2017. As can be seen above, our figure is different than that of which is provided by the company. This is due to two reasons. First, it appears that recently options or warrants were exercised to the tune of approximately 2,000,000 shares. This was not disclosed by the company, aside from the noted share count increase at the bottom of the latest news release. Second, we included the shares held in escrow in the current count. For market cap purposes, we’ll use the figure provided by the company of 85,393,036, which as of the close on December 8, 2017 places a valuation of $22.2 million on the company. Fully diluted market cap is approximately $37.9 million. Also of note, is that a current raise that is in progress was not factored in to this share structure. This will add approximately 2.27 million shares outstanding to the company, and additional warrants to the same tune. 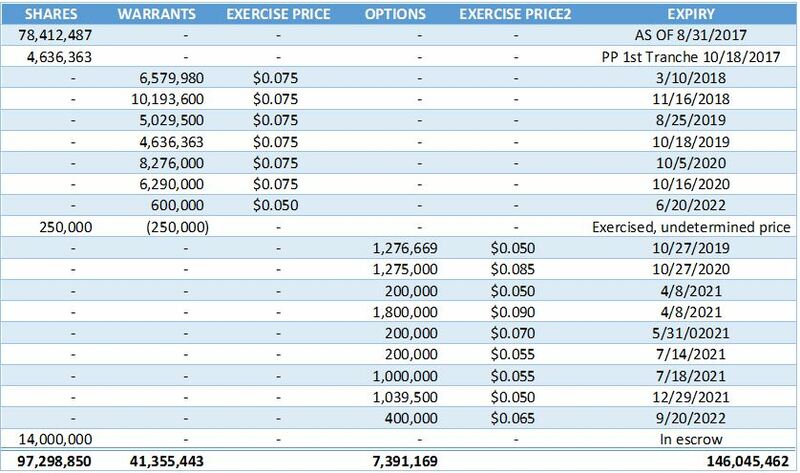 Lastly, please note the current prices related to existing warrants and options. None of which are over the price of $0.09. This will prove to be a major issue in the future for the company. There are two fatal flaws in the concept of Cuba Ventures’ Revolupay. The first, simply, is that that Cuba is a communist nation that controls its economy. It is highly unlikely that they will allow an enterprise to essentially take their central banking system out of the equation by circumventing it with a new currency. It simply will not happen. Cuba is a nation that until 2017, would not allow internet accessibility in the homes of its citizens. Based on this alone, it is extremely doubtful that they would allow a private corporation to take control of their monetary system. This leads us to the second fatal flaw. As a direct result of being a communist nation, internet accessibility in Cuba is not comparable to that of the Western world. Within the country, the government controls access to the world wide web in its entirety, and monitors its citizens use of it. It is notoriously difficult to access the web in this country. In an attempt to quell investor questions related to internet accessibility in Cuba, the company displayed the following slide at the end of its November presentation. 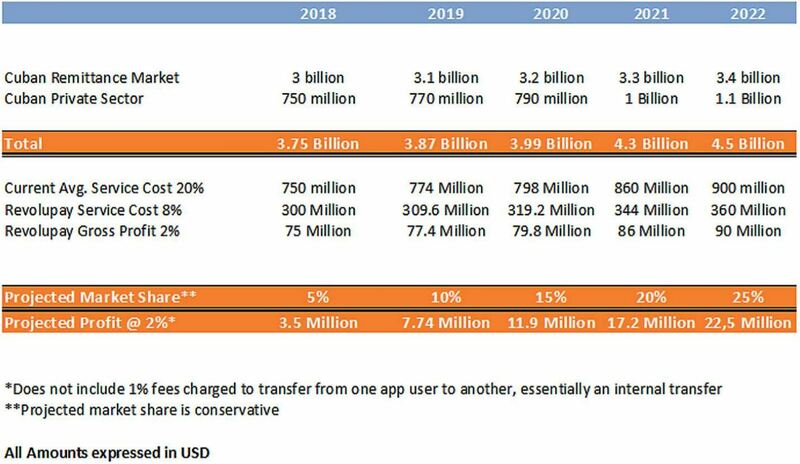 Cuba Ventures informational slide on internet access within Cuba, from it’s November 2017 investor presentation. Cuba Ventures attempts to dispell any concerns related to internet access on the island nation, by indicating that reports on the topic are outdated. However, we we’re able to find several reports published in 2017 alone. Within these reports, are accounts of varying degrees of internet restrictions. We’ve outlined the consistencies throughout these articles. Internet accessibility is via prepaid cards from ETECSA, the government run telecom. These are then used at Wifi access points. Priced at $1.50/hr – which is steep considering the average wage is $25 a month in the country. Home use is being allowed on a trial basis, implemented at the start of this year. Accessibility only in hotspot locations established by the government. With that, it is clear that Revolupay will not work within the communist regime of Cuba. 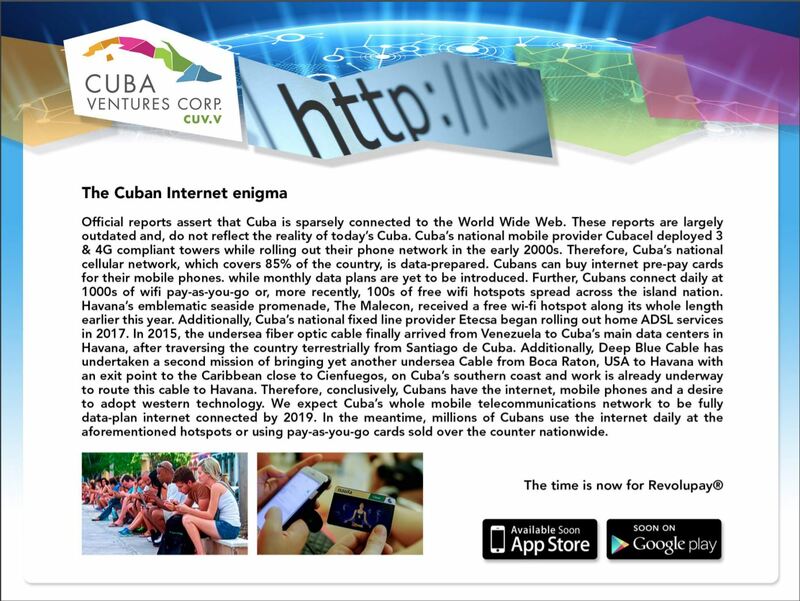 In order for this mobile application to work, Cubans need easy access to the internet. That simply does not exist at this point in time. Individual business’ don’t have permission to establish their own Wifi, which doesn’t even account for the cost prohibitive nature of internet access within the country. How can a business venture such as Revolupay be expected to flourish, when the requirement of internet access has not been met? In theory, Revolupay may appear to be an excellent concept to investors. It checks off several key boxes for easy adoption – the economy is heavily based on cash, credit cards are not available, and its a pain point for tourists to have to carry so much cash. However, several areas of the business concept were not appropriately addressed – for example, the fact that Cubans currently have to wait in long lines just to achieve internet access. If internet access is truly opened up for Cubans down the road, there might be a higher probability of success for Cuba Ventures in this regard. Until then, the success rate of this mobile application and the CCU Coin cryptocurrency is likely going to be minuscule. As for the other lines of business for Cuba Ventures, it needs to focus on profitability. Unless the company can significantly reduce its expenses in comparison to its revenues, there is little value to be had in this company. It can hardly be argued that this portion of the company is in a growth stage – some of these websites have been in operation for twenty years. Thus it needs to focus on a long term outlook, and determine where it can cut costs to keep the company afloat. Lastly, Cuba Ventures needs to reevaluate its current share structure. With the countless options and warrants printed on cheap paper that exist, it will be tough to find new investors at higher share prices. This paper will undoubtedly serve as an anchor weight to future share price momentum, as the selling pressure will be consistent. With the latest upward move, this process has already begun. Don’t confine your research to just your focus company. Consider the macro issues. Dive Deep. Information for this analysis was found via Sedar, Sedi, Vesilen Investments, Travelucion, Wikipedia, CNN, Phys.org, Wired, and Cuba Ventures. The author has no securities or affiliations related to this organization. Not a recommendation to buy or sell. Always do additional research and consult a professional before purchasing a security. The following webpages were used in relation to research conducted on Cuban internet access. All were accessed on December 8, 2017. 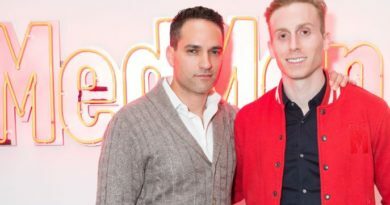 BRIEF: Mezzi Holdings – From Handbags to Blockchain?